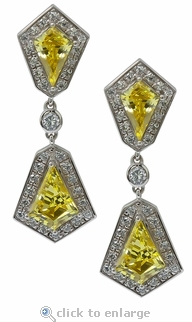 The Dynasty Art Deco Canary Kite Cubic Zirconia Halo Drop Pave Earrings are stunning, period. Nothing else to say. 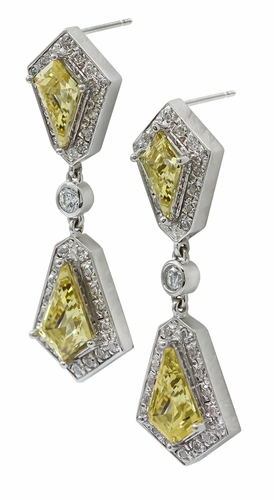 Our diamond quality kite cuts are unique and custom, reminiscent of the Art Deco Era. 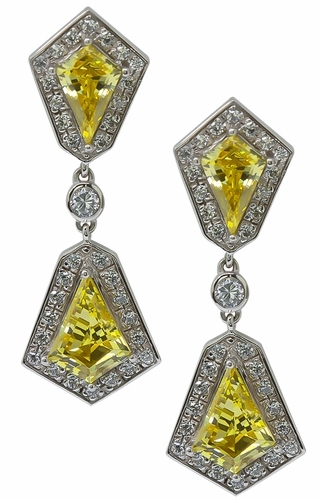 The earrings measure approximately 1 3/4 inches in length and include a total carat weight of approximately 10 carats of the finest Russian formula lab created laboratory grown cubic zirconia that is hand cut and hand polished to exact diamond specifications. 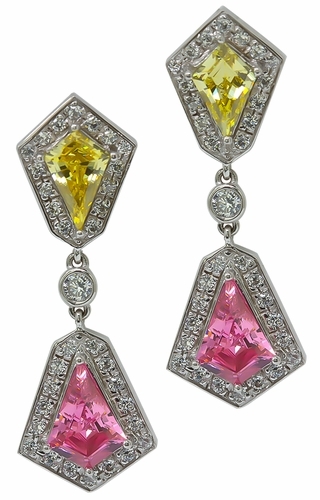 These earrings are custom made for each order and are available with your choice of kite colors that include man made red ruby, blue sapphire, green emerald, or simulated pink diamond, canary yellow diamond or diamond look. Please see the pull down menu for options. 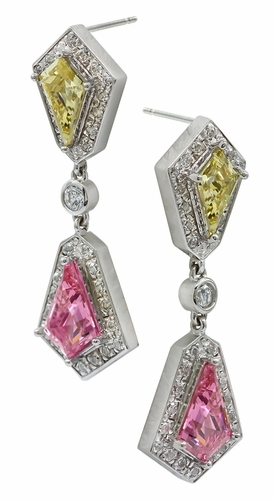 Also choose from solid 14k white gold or 14k yellow gold. These earrings include standard 14k gold push backs or you can upgrade to the large back option, please see the pull down menu for options. For further assistance, please contact us directly at 1-866-942-6663 or visit us via live chat and speak with a knowledgeable representative.